The nearly one acre park, called King Street Park at the Waterfront, will be located along the riverfront using the land where the Old Dominion Boat Club building and its parking lot once stood. ALEXANDRIA, Va. — After years of planning, officials broke ground for the new “King Street Park at the Waterfront” in Old Town Alexandria. The nearly one acre park will be located where the old King Street park sat along the riverfront, using the land where the Old Dominion Boat Club building and its parking lot once stood. They were demolished to make way for the new park. The commission studies and handles all issues relating to the commercial and private use of the waterfront. The park is expected to open in the fall and aims to open up public access to the riverfront. As well as being a recreational space for visitors and residents alike, the park will also be a flood mitigation project to prevent the flooding that occurs at King and Union Streets. 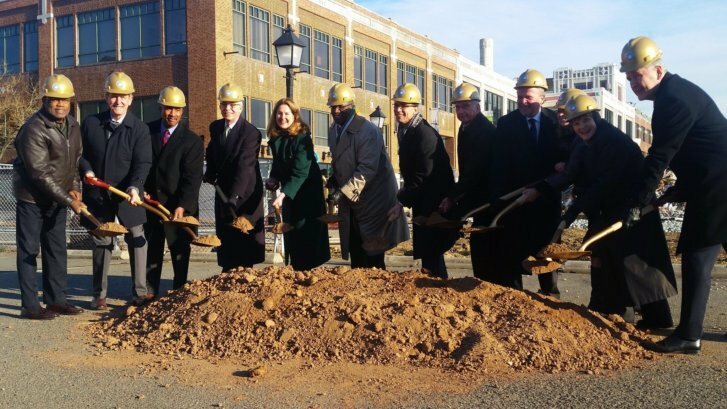 Alexandria Mayor Allison Silberberg, along with city council members, former Alexandria Mayor Bill Euille, Congressman Don Beyer and Alexandria residents came out to King Street on a frigid morning for the ceremony. “It’s a great honor to be here at this groundbreaking ceremony which symbolizes the beginning of the implementation of a waterfront development plans that have been decades in the making,” said Stephen Thayer, the chair of the commission. The Alexandria Waterfront Plan was approved in 2012. The Phase I landscape and flood mitigation design for implementation was approved in 2014. For more information about the plan, visit the City of Alexandria’s website.